Hopefully, when I get organised and I find a nice picture of Ms Talia with a helmet on (probably not going to get there)… then this post shall come from the lovely Studio for All Things. A thinker, a rider, an ideas curator (if I build it, they shall come), Tals always leaves me thoughtful. Even all the way away from NY, NY. This is when Tals thinks helmets can get really hot*, as she indicated when she sent me this link to helmets repurposed, upcycled, and breaking new ground. I am not kidding. 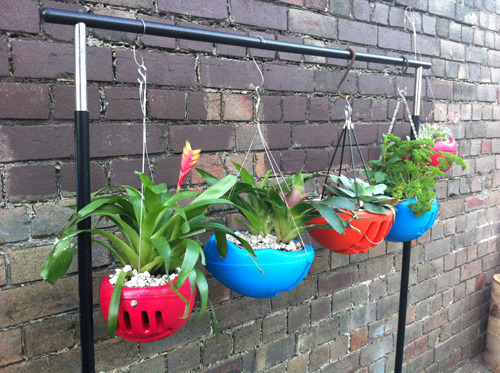 I would genuinely create a hanging garden from helmets. Not least of all because I’d be guaranteed good drainage. *Tals, at this rate I should write copy for the Herald Sun. Really. I’m ashamed of myself. It’s like I should get my HECS debt erased because clearly I have done nothing with my higher education.